Why was France on the brink of revolution in 1789? A DBQ (Document Based Question) on France leading up to the revolution. This is a combination of primary and secondary sources. Hosted by George Mason University's Center for History and New Media and the American Social History Project, this website features a collection of primary documents, images, maps, and other information about the French Revolution. 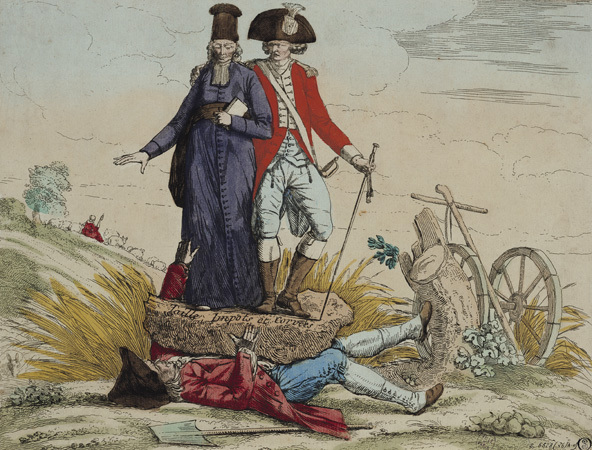 In this political cartoon titled "Tithes, Taxes, and Graft" from the French Revolution era, the crushing burden placed on average French citizens by the nobility and clergy is depicted. Hosted by Fordham University, this website contains a collection primary documents pertaining to the French Revolution. French Revolution (part 2): Royals try to escape. Champ De Mars Massacre. Declaration of Pillnitz. Movement towards becoming a Republic.